The new norm will become effective as of 2018. President Petro Poroshenko signed the amended law on e-declarations obliging anticorruption NGOs to report their finances by filling out e-forms. Earlier on Monday, 27 March he met public activists to discuss the amendments. "The head of state underscored the importance of signing this law due to the necessity of taking into account the interests of hundreds of thousands of servicemen who currently defend Ukraine from the Russian aggression," the presidential press service reported on 27 March. "Given that the obligation for NGO representatives to fill in the e-declarations comes into force as of 2018, pursuant to the proposal of the president, the parties agreed to establish a working group with the participation of NGO representatives, people’s deputies and representatives of the presidential administration with a view to elaborating the agreed amendments to this law," it said. 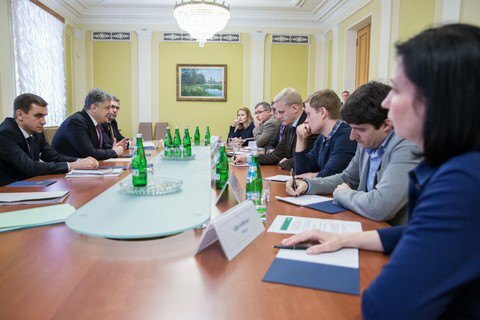 Poroshenko hailed the efforts of NGOs in the field of fighting corruption and stressed that any political pressure is inadmissible. The bill obliged a number of persons, including members of anticorruption NGOs and candidates for deputies and presidents to file electronic income and property statements. The USA, the UK and the European Union criticised the introduction of e-declarations for anticorruption NGOs.